Try the Tool that Recovers Google Penalties, Now! This is a TRUE, SUCCESSFUL & UNREQUESTED story from Manuel Porras, one of our customers. Read the full-disclosure at the end of the article. Let me tell you my experience with CognitiveSEO and the Google Disavow Tool. I’ll begin a few months back in time. 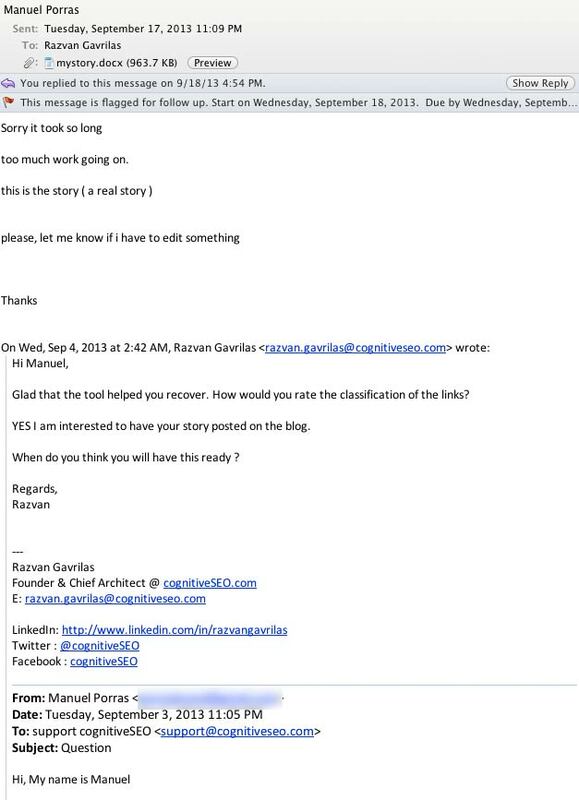 Note by Razvan – You can find another traffic screenshot in the mail conversation I had with Manuel, at the bottom of this email. One of the websites I manage SmartLipo.com had suffered considerable Google ranking + traffic impact with the release of PENGUIN back in April 2012. But the first releases of penguin did not kill us completely from Google’s Organic results. Google traffic kept dropping slowly over time. Until in May 22, 2013 the 4th update of PENGUIN was released. After this release we dropped and dropped and dropped in rankings for our main two keywords. Traffic from Google was almost none soon after that. One day in May my boss tells me to try the disavow tool. I was very skeptical of using it, having read that it could be harmful if used wrong. But what else did we have to loose? Google de-indexing us perhaps? He (my boss) pointed me to use this tool he saw that featured an Unnatural link detection option. I went and played a little in Cognitiveseo. I created a new campaign for the site, the report was ready after a few minutes. I decided to import links that I exported from webmaster tools. I just felt more secure adding some extra link data. I decided to run the link classification, it takes a few minutes. I decided to go slow, and take my time. As I mentioned I am too skeptic and cautious (that can be sometimes a problem when you need to react fast). Anyway I decided to take a look at every domain and almost every link, I was not sure to trust the unnatural link report from the beginning. I went and checked with my own eyes almost every link and every domain (no matter if suspect, unnatural or ok). I found some unnatural links that I liked and some ok links that I did not trust. But in general I ended up agreeing with the report in a considerable percentage. Apart from the few links I manually readjusted from OK to unnatural and vice-versa I did not have much work to do on the report. I took a second look (took me some time), and decided to export the domains I marked as disavowed (well actually all suspicious and unnatural ones). Once outside Cognitive I went and took a last look at the domain entries of the disavow file, making sure no good domains were in it (at least the ones I consider vital: e.g. Facebook, twitter accounts, trusted customer sites linking back to us, some blogspots.com domains, etc., you get the idea of which site you can trust). On July 9th submitted the disavow file to Google (made the sign of the cross). I captured a screenshot to show later my boss that I did use the disavow tool as he suggested a few days back. I continued with my life. I kept checking rankings every other day, nothing seemed to change the first days, the first weeks. Close to 3 weeks passed after the disavow submission, when all of a sudden one day when I run the rank check (using a VPN tool) from different IPs and different states in the US, I saw that our site was raking #3 and #2 from many different locations. At first I thought I was doing the rank check wrong, maybe the VPN is not working and I am doing a local search? Maybe the browser cache is holding onto my Google session? Are these results personalized? I did not want to get any false hope so I did not tell my boss about the news, I decided to track ranks for the next days, every morning. The ranks were consistent, #3, #2 and even #1 in some cities. 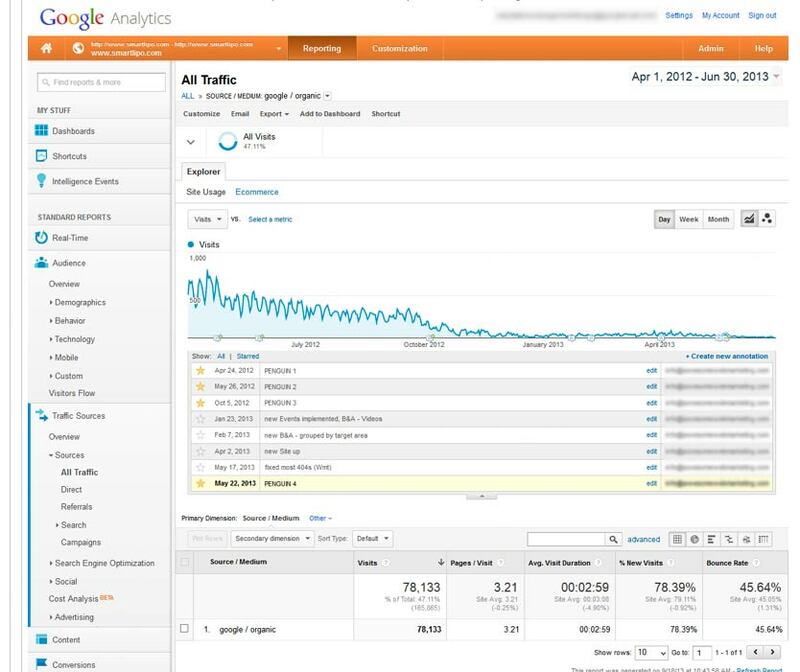 I finally accepted it to be true as I saw the increase in traffic in Google Analytics. I did not want to celebrate, maybe its temporary, maybe google is playing a prank on us, maybe it’s all a dream. Well that dream has been going on for the last 5 weeks. Although I have done many things to my site, I am pretty f***ing sure the disavow submission was the one that helped me back in rankings. I could have done it without the help CognitiveSeo.com, yeah but it would have taken me weeks if not months to find out by myself which links are bad and which not, and webmaster tools does not give me many links that Cognitive does. Cognitive is a perfect way to complement what webmaster tools shows you (external links). And now I know that Cognitive saves a mountain of time classifying bad from ok links. Cognitive is not paying me to write this, I just want to acknowledge and share this story with the skeptical ones like me out there. Hope it works for you as it did for me. If you do it right, I am sure it will. On September the 3rd I received the first mail from Manuel, (I did not know him until then). I answered him that I would be interested in his story, but he never got back … until 17th of September, when he mailed me the story that you just read. 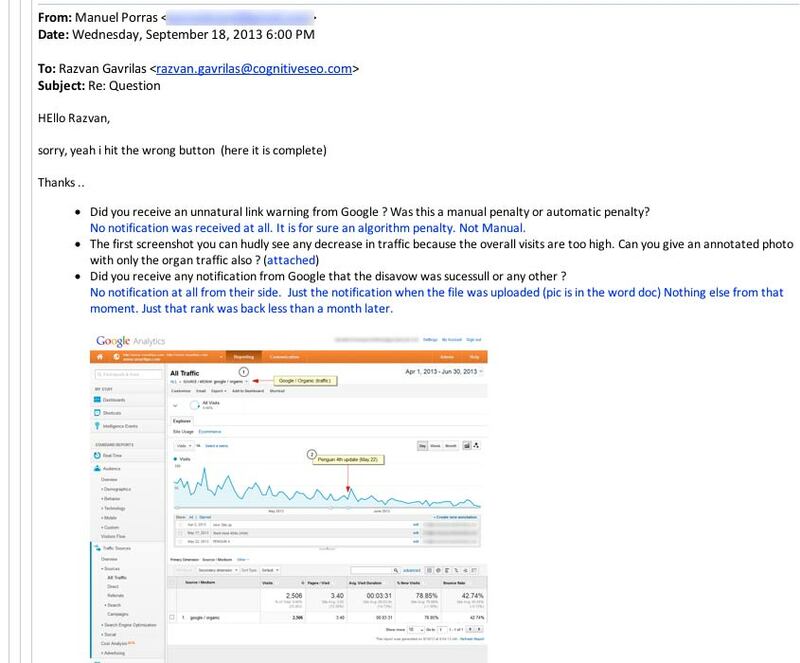 I don’t have any knowledge about a recovery using the Google Disavow on an algorithmic penalty. 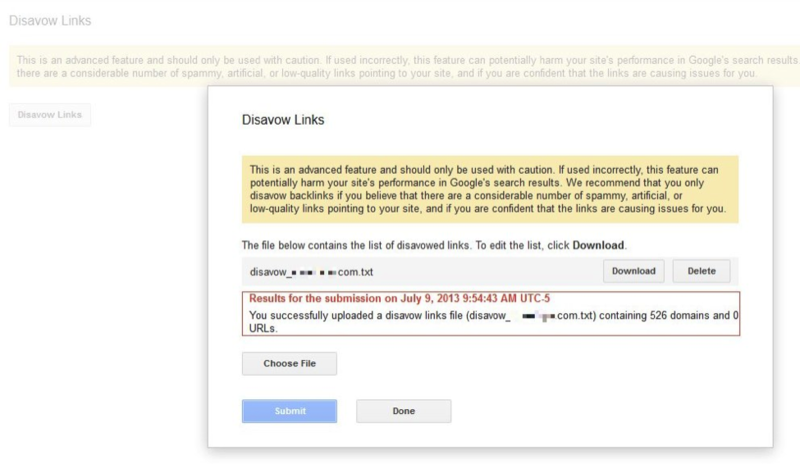 Only manual penalties have been publicly reported to work using the Disavow tool. Knowing this I wanted to be 100% sure that this isn’t something else. I took the diligence and analyzed the situation carefully. 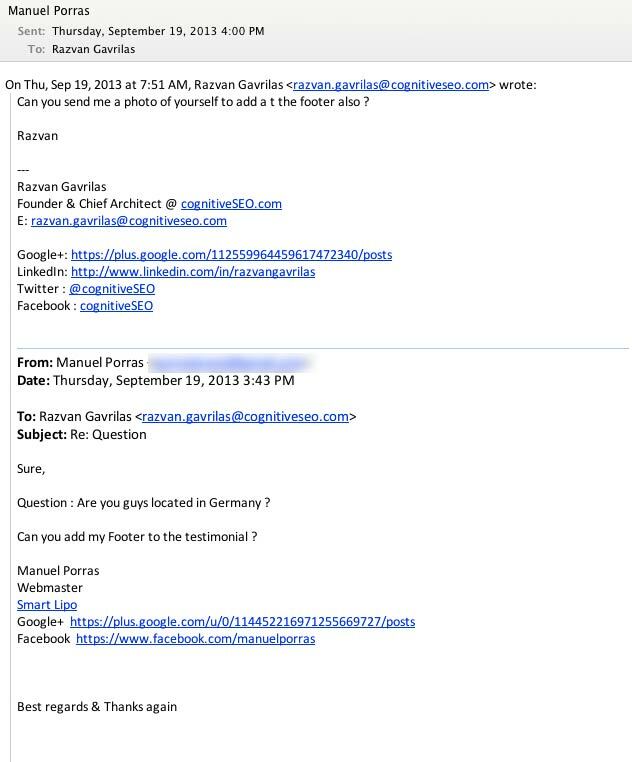 Here is the full transcript of the mail discussion between me and Manuel (for the sake of full transparency). As the founder of cognitiveSEO, I am extremly happy and proud when people connect with me and tell me their successful stories on how the tool made their life easier. I want to take this opportunity to thank you all, our customers, for making this possible. It is YOU that give us the power to innovate & solve your problems faster & better. Hi, thank you for sharing your experience, it sure helps in giving some hope for all the websites sunk by the Penguin. Just to be clear: it seems that you recovered without the need of any Google Penguin (or Panda) refresh? I was also skeptical, I was using disavow before but without detailed view of each link, just was looking over certain link for me and I delete it from disavow file. In one case I saw improvements, but I decided to disavow all the links before 2013 that were acquired by using old SEO methods. Cant wait any movements after I did cleaning again using Cognitive which were maid similarly to Manuel..
good luck on the recovery! I just read your amazing testimony and I have a question: what is the % of links “suspicious” and “unnatural” that you kept and disavowed from the cognitiveseo report ? thank you. And BRAVO for your healthy website that recovered from google penalties !!! I disavowed a total of 526 domains (among suspicious and unnatural) of a total of 2048 reported domains. So that is like a 25% ? Kept the rest. I think its not about the quantity, but more on disavowing the ‘right’ bad domains/links that are ‘hurting’ your site on a certain keyword. tks for commenting on the blog Manuel. Correlation does not imply causation. Right around that date (Jul 18th) Google tweaked Panda too. indeed. might be this also : Removed links we could remove, and contacted webmasters to help us removing (suspicious links). It might be a complex number of factors. Problem is with Google you never know anything for sure. U could guess what is the most close to the correlation. Tough. The facts though make me believe 95% this is what it is. I’m quite skeptical about this, and do agree with Mogens. Here are a few updates from John Mueller regarding the Disavow Tool and Penguin refreshes: http://www.hiswebmarketing.com/penguin-refreshes-regularly/ . If you read the updates at the end, the author’s conclusion is that you can gain traffic by improving your website and its links, but the actual Penguin penalty won’t be removed until the algorithm refreshes its data. In this case, all of the improvements Manuel made to his site managed to improve his website’s ranking, but in theory he should see a bigger boost in the next Penguin refresh due to the algorithm processing his disavow file. I was too. I also agree that everything that was done to the site had a certain influence on ranking recovery and improvement. broken link down there mate..
might be this also : Removed links we could remove, and contacted webmasters to help us removing (suspicious links). all the things for sure had an impact. I had a very similar scenario. I was hit by the second Penguin update and did everything I could to get it resolved, removing 100 links or so that I was able to identify as toxic links. Nothing seemed to work until I found CognitiveSEO. I used your tools and within 2 weeks of submitting the newest disavow file I was completely recovered. Was it a manual penalty or an algorithmic one ? For those using the disavow tool did you try to get toxic links removed first? Or did you simply dump all of the toxic links into the disavow form and submit? yap. this is what he said. Has Manual’s site made a full recovery now since the latest Panda update 2.1? < This launched Friday. i think you refer to Penguin not Panda. Yes sorry Penguin..So many animals to remember! So far, no changes for the site in Google. What does this update do ? Are you back to normal pre-penguin traffic levels? Our site: jobuzu was hit by Penguin 2.1 and i am using CognitiveSEO to delete/disavow toxic links. I have noticed a huge number of forum and blog commenting spam < nothing we have done! I am concerned how long this may take? Traffic levels are not the same, and this is not due to panda nor penguien i assume. It is related to the lifespan of the keyword. The main keyword used to be very trendy back in 2008-2010. Since then it has slowly comming down over time. Another factor are the seasonal search behaviors. We actually start slow in January then traffic increases in summer to later slow down again in december. Although we gained good rank from several (states/cities), traffic is not the same (sadly). Its not bad, but its not what it used to be in its “keyword Glory days”. Lets see how Penguien 2.1 will affect us all. I was also skeptical, I was using disavow before but without detailed view of each link, just was looking over certain link for me and I delete it from disavow file. In one case I saw improvements, but I decided to disavow all the links before 2013 that were acquired by using old SEO methods. why is it that almost every example of ‘recovery’ involves a site with less than a couple thousand visits a day. I challenge CognitiveSEO to show success using the disavow tool with at site that last dropped 10,000 or 20,000 visitors a day. We dropped well over that amount of visitors a day. I will update on here if we come back from using the software. sorry to hear. be sure to identify the risk of being penalized based on your links. run the unnatural link detection and see what the software provides. Thanks for sharing this set of instructions. Really informative. Affected by the recent Google updates the September 4.
to best use the diavow tool you should first segement the link profile based on the naturalness of the links. Mark for Disavow the Unnatural Links. not sure i understand the quesion exactly. I have a client who has website with a very unnatural link profile. They had over optimized their site for a few very competitive keywords. This site has 1500 backlinks (mostly from low quality bookmarking sites & article directories) & 70 root domains linking to it and is no where in the Google SERP. On the other hand this site gets decent traffic from other search engines. would the disavow tool work if I submit around 350 bad links to that website? how much time does it take to take effect? there is no specific timeframe. it can take from a few days to a few months. also I recommend you to send all the unnatural links not only a section of them because the disavow won’t work. Has your recovery been permanent? I know of many websites that have made a 2-3 week recovery only to drop down again, sometimes even worse than ever before. it seems the recovery was permanent. yes. Article is very effective but i am interested to know that fact of social media submission. One more thing – is it still important to check the DoFollow and NoFollow while taking a backlink ? Is it just for Penguin update as you know we have many animals. I think we will have many animals at 2014. Thanks for such helpful post. I want to know about disavow link format. When we are going to disavow the spamy links, we need to put the spammy link into the simple text file or is there any disavow format?? Please provide a disavow links format sample. also inside cognitiveSEO the system will automatically generate this file so you do not need to do anything specific about the format. Awesome read for sure, Just now before few minutes i have filled the form on your website, have sent your connect Request over LinkedIn, as i have about 30 to 35 projects on which i need your help big time. Would appreciate if you can look in to this matter personally & help us to achieve our position back in engines. Must say this written piece is so informative and helpful for me.But tell me one thing after disavow the 8 Spam links; my website shows the updated results with 0 domain 0 URLs.Confused about the information. Is it so because webmaster clear the cheap links? Today my manager shared this link to me. really i enjoyed reading this useful info. I did experiment on Google disavow tool, Manually Collected spamy/Unnatural links, remove through Google disavow tool. I think its working fine. But it is very difficult to find natural/unnatural links. I will try to use cognitiveSEO. My website percussionconga.com got hit by Panda on 25th April 2012. Since then I removed most of the advertising and affiliate links, I removed over-stuffed keywords in categories and titles, and I disavov all the bad links I had. But still nothing, the ranking is not recovering and if I search for “percussion conga” I’m nowhere. Do you have advises based on your positive experience? The website has nice content and it’s a pity that is getting so little traffic. Panda and Penguin are two different beasts. 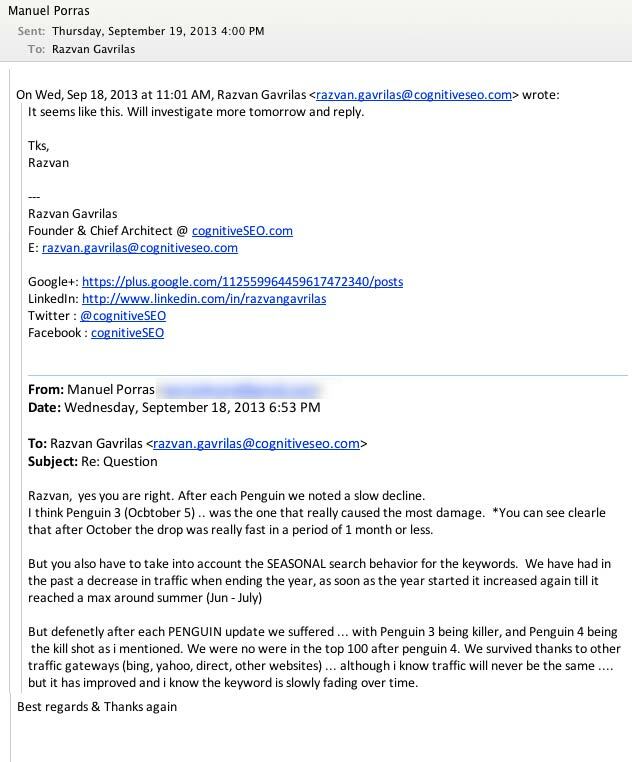 If you were hit by penguin ( unnatural links) than disavow makes sense. For Panda is mostly Onpage stuff. I sent two weeks to file disavow but still do not see the benefits … my site is now irrecoverable …however, cognitive seo tool is a great tool, congratulations! have patience and build high quality links without thinking at SEO, as you used to, for a while. Just dilute your link profile while waiting. I think it’s very important tools when cleaning up your site and getting rid of bad links.I have faced with a very strange situation. I have cleared up my site completely from any low-quality links. Any positive response fallowed from Google team. Any explanation comes neither. Any thoughts on such case…? Would be grateful for any advice. this happens all the time. Google does not respond to all requests. You are left with no alternative if you want your site recovered. Disavow the unnatural links and build high quality ones in the meantime. Natural Ones!!! I’m honestly lost. On November 8, I used the “Google Disavow Tool”, sending the txt file generated from CognitiveSeo tool – Unnatural Links Detection. On November 27, the result took effect, the visits were returning to normal, but starting from December 17 returned the same amount of hits that was before using the tool disavow. That is only a temporary effect was a false recovery. Ps: Brazilian website, during the period so far no changes (visual, code or hosting) were made in site. Only updates of new contents. Anyone been through this before? Any help will be very welcome. Thank you. This might be because of a totally different issue. Google has some significant updates during these days. 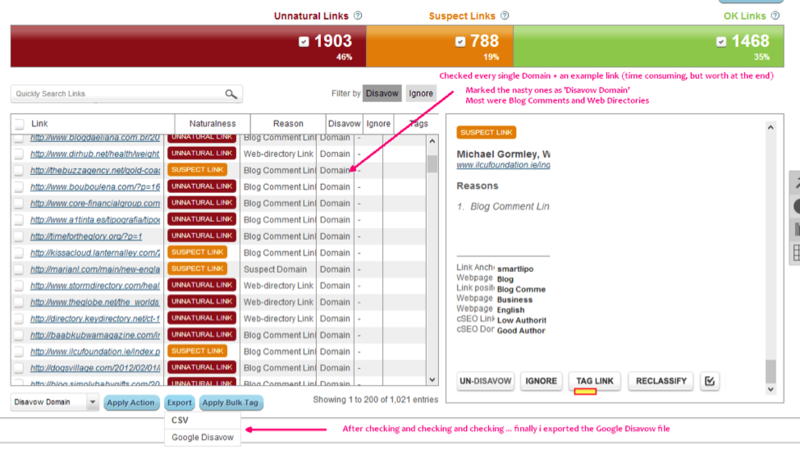 For example you could see here http://algoroo.com/ a high flux on Dec 17, the same day you report for loosing rankings. Hi Razvan, how are you? I’m still in the same situation. I believe there wont be changes in the Google algorithm in this period of year end. Warm changes of November 27 and December 17 affected me in full. It remains to wait and work on the content until next year. I truly believe that our content is much better than the first 10 competitors displayed in several keywords. If you have any tip or suggestion will be very welcome, anything please contat me. just build good links (HQ) no commercial anchors or shady techniques. Increase the brand awareness in the eyes of big G :). it should work but sometime s it takes a lot of time and effort. I’ve used the disavow tool on several sites starting in October and not one of them have improved in rank yet. It’s practically useless to get sites to remove links as they are about 90% ignored so I hope Disavow eventually kicks in. sometimes recovery means only growth unlock, meaning you are allowed to grow back, not necessarily ranking recovery. there are so many cases. I would recommend direct Disavow no more Link Removal. 1) When a site has tens of thousands of suspect links but no manual penalty, is there any value to submitting the disavowal file without first attempting to get all the suspect links removed? Or would it better simply to change to a new domain? 2) Do you know whether it’s bad to 302 redirect a domain hurt by Penguin to a clean domain? I did this to a site last year and traffic immediately started to recover, but then it seemed to be hit by the Oct 4, 2013 Penguin update and traffic fell back to the same lows level as before the new domain was pointed to the site. I have run an inbound link analysis on the current domain and it shows only a total of 50, three of which are marked suspect, though I know that two of them are good links. However, Google Webmaster Tools lists thousands of links from the old domain. Glad you find the tool useful. Let me answer your questions. 1. If no penalty is applied manual or algorithmic I would not recommend any disavow. If any of these penalties might be applied and they are related to unnatural links then I would suggest to upload a complete disavow file and in the meantime build new quality links (natural) to the site. 2.Google surely will catch this technique. So I would not recommend it. It is always good to also import the GWT data in the tool to compliment the link data and that way to have a more complete view of the links. Thanks for sharing such information. Sir, my site ispecia.com got penalized some days back. There are just 13 baklinks. So I don’t think there is any issue with the links. I used two AdSense ads: One just below the Header of page and one below the post title. What can be the issue with my site? Its is surely a great SEO tool to rescue you in difficult situations. I have tried Moz and some other tools too. but cognitiveseo is best. Hi..Razvan thank you very much my friend really I like it keep in touch from INDONESIA. It is really a nice tools to get rid of google penalty. Thanks Razvan. I m running one eCommerce website related to the matrimonial “wwww.lovevivah.com” . This website come in penguin 2.1 google algorithm in 4 October 2013. I had submitted disavow file in GWT in December 2013 which links i fill not related to my website team or low PR links. But, i did not get any benefit in rankings..Can any one suggest me but i should to get rank back in Google. there can be a variety of reasons. It may be that you did not send a complete disavow file. Maybe this is not the problem of your low rankings. etc. I suggest to run an analysis in cognitive and see exactly where you stand from an Unnatural Links point of view. Thanks for sharing such information my many site got penalized some days back. There are just more back links. So I don’t think there is any issue with the links. I used this tools and give me effective results now. I have a website, http://702clubs.com that was making me great money and now I lost my “Golden Keyword” I have been trying to bring it back and am honestly thinking about trying this as my actions and thoughts are just the same as you explain in this article. I thank you for the info and plan to sign up very soon! Awesome. But I couldn’t believe that this disavow tool helped to recover from algorithmic penalty. It might be a miracle or a luck. Anyway, thanks you for writing this content and efforts you made. Good to see there is a tool to recover from Penguins kick. Really awesome experience and tool. need to try the cognitiveseo. I think now it’s required to submit a reconsideration request after using Google disavow tool, I have tried using just google disavow I have disavowed all my backlinks and I didn’t get any changes but whene I submited a reconsideration request it tooks only one week and after that I have got my ranking back. there are cases and with the latest Penguin 3.0 the algo and updates are continuos as it is reported by Google. It is refreshed on the fly almost. Thanks Razvan Sir For This Sensational Post…. Will Apply Your Strategies And I Hope I Will Get My Ranking Back ! Well, penguin is dangerous, specially for those who are not aware of Good Link building strategies. They can get hit by this algorithm update quite easily and recovery for them is also very difficult. Being faced this scenario in my blogging career, I can easily understand the pain of recovering a blog from Penguin penalty, as it can months to remove bad backlinks and then, wait for the penguin refresh, sot hat our blog gets free from penalty. Anyways, I must say, the post is quite good, well written. Thumps Up for this. Recovery from Pinguin is not easy, but if you know what you are doing, then nothing si impossible. This post is very helpful for newbie bloggers like us. Thanks for sharing this as i am always afraid of google’s penalty. Great article. 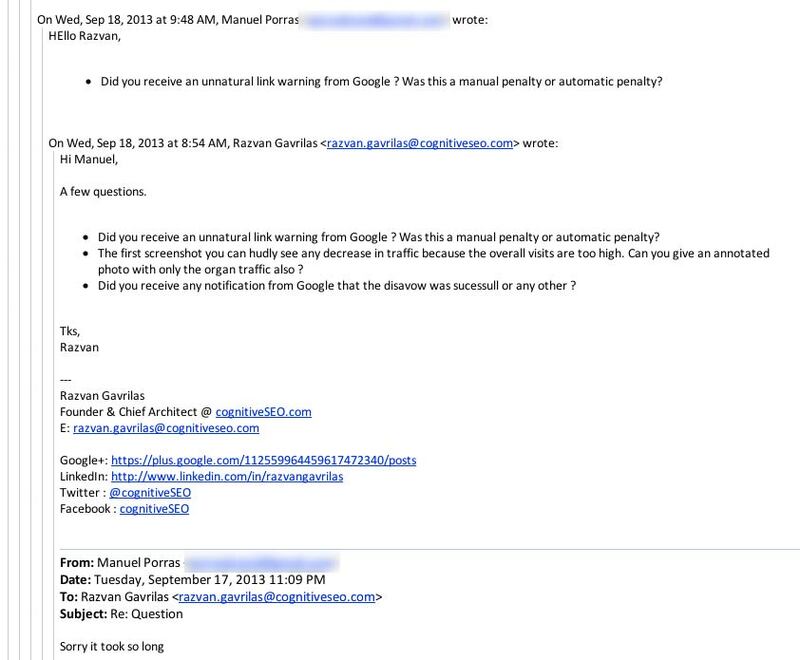 Thanks for sharing this article, Does google penalty effects news websites too? My website is included in Google news but after the update, the site has affected and the rankings have dropped. Leave a Reply to Avinash Kumar!